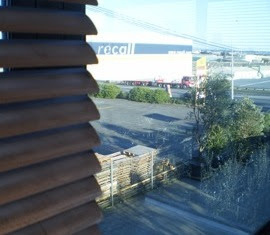 "I don't normally notice anything negative about Auckland's air quality but I have noticed the grime on these venetian blinds in an office in Church Street, Onehunga. They are cleaned regularly but they get dirty very quickly. Church Street is a four lane highway where 300,000 vehicles pass through a week. As Onehunga has a lot of light industry, there are a lot of trucks and heavy vehicles. Seeing things like this makes you wonder about the levels of pollution you would be exposed to if you worked in this office and the effect it could have on your lungs and general health. Several of my friends have asthma (including the person who works in this office) and sometimes I have suspected dust mites and insufficient vacuuming but perhaps poor air quality is part of the reason for their respiratory difficulties."